The extraordinary bounce-back of the banks reveals the most disturbing, but least obvious, largely invisible, feature of the unfinished European crisis: the transformation of democratic taxation states into post-democratic banking states. The following reflection on the subject of banks and democracy has been prepared for a forthcoming OECD meeting in Paris, in late-May 2013. The text is long, stretching the definition of a field note on present-day democracy. But such matters are sadly neglected by contemporary theorists and analysts of democracy. Five long years into its worst economic slump since the 1930s, the European region now resembles a boiling pot of contradictory political trends, most of them traceable to the past misconduct of banks and bitter fights over their future. From a distance, it’s hard to grasp the scale and intensity of this worsening crisis, or the deep public disaffection now directed against banking and credit institutions and their government protectors.The shock and anger among citizens is palpable, for instance in Cyprus, whose offshore banking system has effectively been terminated by an EU bailout deal, for which not one member of the local parliament voted. In Greece, criminal charges have been brought against Andreas Georgiou and other officials responsible for overstating the country’s debt, so contributing to the implosion of local markets and compounding the public misery caused by enforced austerity. Deutsche Bank, Germany’s largest bank, is subject to a new investigation of claims that it falsely valued credit derivatives so as to avoid a government bailout by concealing losses as large as $12 billion. In Spain, the cajas (savings banks) have all but disappeared and their consortium replacement, known as Bankia, has crashed, leaving behind a trail of wreckage. In Britain, uproar has greeted revelations that nearly 100 top executives of the Royal Bank of Scotland, which is 83% owned by taxpayers, were last year awarded pay rises of a million pounds, despite the fact that its quality of service is poor and its internal computer systems have suffered from prolonged collapse. Public disaffection with the state-owned bank has been compounded by its conviction (by the British state!) for fiddling the bank inter-lending rate (LIBOR), and by the sizeable fine it has been forced to pay, at taxpayers’ expense. Given such obscenities, for that’s what they are, it comes as no surprise that the quaint old reputation of bankers as uncorrupted local men prone to dapper eccentricity, but fair-minded in their disbursement of money, has been blown apart. In more than a few European countries, the neologism ‘bankster’ is now a popular term of abuse. It was probably first used in Italy, where the oldest bank in the world (Monte dei Paschi di Siena) has been bailed out with state funds (4 billion euros) paid for by taxpayers. 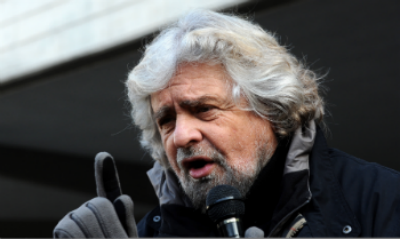 ‘Once there used to be gangsters’, joked Beppe Grillo, well before the onset of the present banking crisis, and his recent stunning electoral success. ‘Today, we have banksters’. Since then (1998) he’s regularly hurled jokes at thieving bankers, often comparing them to dogs, who at least can be trained to return things honestly. In one of their wilder moments, Germany’s Der Spiegel has dubbed Beppe Grillo the new Mussolini, ‘the most dangerous man in Europe’, but the plain fact is that his hyperbole resonates with millions of Europeans, who know in their guts that the banking and credit sector remains both dysfunctional and deeply hurtful of the lives of citizens. Scandals centred on interest-rate fixing and mis-selling continue to erupt. Bank tycoons are still paid handsome bonuses. Politicians defend them. Two months ago, efforts by Brussels to apply stricter caps on bankers’ bonuses were slammed by London’s Mayor Boris Johnson as a ‘transparently self-defeating’assault on ‘banking talent’. In many countries, banks have meanwhile stopped doing what they’re supposedly chartered to do: to lend money to individuals, businesses and organisations at affordable rates of interest. In Britain, whose 30-year boom was hitched to the power of the City, bank lending to small and medium-sized businesses continues to drop, despite cut-price loans from the government’s Funding for Lending Scheme. To make matters worse, the Bank of England has recently warned that in 2014 more than a few companies are vulnerable because before the crash they were saddled with huge debts by private equity firms that bought them out with money borrowed from banks. Meanwhile, whole banks continue to drop. Two months ago, the fourth largest bank in the Netherlands, SNS Reaal, was taken into state hands. The €10 billion bailout was designed to prevent the banking and insurance group’s collapse from property loan losses and to shore up confidence after a private investor-led rescue had failed. Part of the crippling cost will be borne by Dutch taxpayers. The sad news for citizens is that the deep political crisis triggered by the collapse of risk-infused, profit-hungry banks is by no means over. There are public reminders that ‘the demons haven’t been banished; they are merely sleeping’ (Jean-Claude Juncker). For the first time in the history of European integration, there are stern warnings that Europe, comprising around 7% of the world’s population and now less than 20% of global economic output, may in political economy terms be irreversibly in decline. Others point out that in the history of modern capitalism there have been eleven large-scale financial bubbles whose bursting caused widespread social damage. Seven of these have occurred since the early 1970s. That’s a spooky fact, which is why nobody, certainly not the political elites of Europe, knows what is going to happen next. For many millions of European citizens, especially for those with eyes and ears, the deepening uncertainty is sobering. They are learning about the deep structural dependence of parliamentary democracy on the financial sector. They’ve figured out that during the past three decades, banks fuelled booms, especially in the housing and construction sectors. They drove what the political sociologist Colin Crouch has called ‘privatised Keynesianism’: instead of governments raising taxes, or borrowing money to fund equal access to such goods as housing, work skills and education, individual citizens themselves were encouraged, at their own risk, to take advantage of easy access to loans, to pay for the services that governments once provided. Meanwhile, thanks to upswings in the loans business, house prices climbed. Millions of citizens felt richer. Employment levels in the banking and credit and real estate sectors blossomed. Young graduates found high-paying jobs; banks became a source of national pride, and they attracted bright and talented young things. Top executives raked in small fortunes from salaries, bonuses and equities. New bank ‘products’ centred on reckless risk-taking and hedging were produced and marketed successfully, sometimes on the sly. (Full disclosure: from direct personal experience as a long-time customer of the Royal Bank of Scotland, I can confirm that the bank operated bizarre off-shore deals lubricated by written and verbal assurances that deposited funds were ‘safe’, and not subject to mainland taxation rules.) In the end, the recklessness of the finance sector came a cropper. It brought whole economies to the edge of a political abyss. The resulting bubbles began to burst all over the place, depressing markets and dragging down whole governments. Then a most astonishing thing happened: at taxpayers’ expense, the banks that had recklessly fuelled the boom and bust rebounded by setting the austerity agenda that is now hurting the lives of millions of people and crippling the parliamentary democracies they once cherished. The extraordinary bounce-back reveals the most disturbing, but least obvious, largely invisible, feature of the unfinished European crisis: the transformation of democratic taxation states into post-democratic banking states. What is meant by this mouthful? 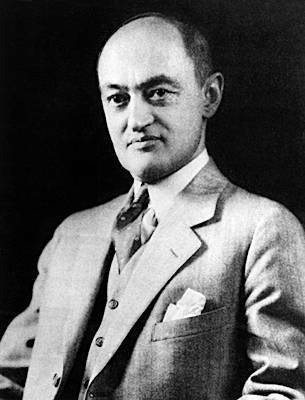 The Austrian economist, Joseph Schumpeter, long ago pointed out how modern European states (at first they were monarchies, later most became republics) fed upon taxes extracted from their subject populations. The point is still emphasised by government and politics textbooks. Usually this is done by noting that under democratic conditions elected governments are expected to satisfy the needs and respond to the demands of citizens by providing various goods and services paid for through taxation granted by their consent. Behind this observation stands the presumption that the creation and circulation of money is the prerogative of the state. ‘Money is a creature of the legal order’, wrote Georg Friedrich Knapp in his classic State Theory of Money (1905). Critics of this view long ago sensibly pointed out that the public ‘validity’ of money also stems from its quantity and purchasing power. But, what’s missing from both the criticism and today’s textbooks is acknowledgement of a deep-seated counter-trend, an epochal shift that has barely been noticed by thinkers of democracy: the emergence of banking states that are structurally dependent on financial markets. Slowly but surely, in most European democracies, the power to create and regulate money has effectively been privatised. Without much public commentary or public resistance, governments of recent decades have surrendered their control over a vital resource, with the result that commercial banks and credit institutions now have much more‘spending power’ than elected governments. In a most interesting new book, the acclaimed historian Harold James has described how this out-flanking of European states by banks and credit institutions was reinforced at the supra-national level, disastrously it turns out, by the formation of the independent European Central Bank. From the moment of its foundation, the wholly unregulated operations of the ECB supposed that money could and should be divorced from the fiscal activities of the member states. The ECB was designed by the Delors Committee, a body stacked with central bankers, who seriously imagined they could insulate themselves from democratic political pressures. They dared look fortune in the face. Preoccupied with keeping inflation rates low, the ECB supposed from the outset that a simultaneous failure of markets and governments was inconceivable. The recent history of these various trends reveals something shocking for democrats. It shows just how misleading is the commonplace perception that banking and credit institutions are just intermediaries linking savers and borrowers. These institutions are in fact political agenda setters – institutions with tremendous power to make decisions behind the backs of elected governments, to veto their policies, or to ransack their structures. Take the central case of Britain, where the City strikingly overshadows Westminster. An estimated 97% of the country’s money supply is in the hands of banks and credit institutions (the remaining 3% is government-created coins and notes carried around in citizens’ pockets and purses). In effect, these institutions rent out ‘digital’ money to the rest of the economy and political order. This gives the credit and banking sector vast powers over all other institutions, and of course over citizens as a whole. The sector determines whether people can rent or buy a dwelling, and whether or not ventures as different as small businesses, wind and solar energy farms and commercial real estate receive funding. Proof of the clout of the sector is everywhere. The financial sector in Britain pays limited taxes (in 2012, only 6% of overall tax revenues came from the banking sector). It’s not required to disclose how it uses its customers’funds. The sector is dominated by oligopolies (in the UK, just 5 banks control 85% of the money supply). They are run by board members blessed with enormous power to shape the economy and government policy, for instance through political donations to parties, or by direct access to policy makers by means of ‘backstage passes’ and ‘revolving doors’. The banking and credit sector naturally provides a comfortable home for retired politicians. Tony Blair now earns 12 times his Prime Minister’s salary as a ‘senior adviser’to JPMorgan Chase; he reportedly earns another £1 million a year ‘advising’Zurich Financial Services. It is painfully obvious that when the financial sector generates bubbles, and when these bubbles pop, as happened during the past five years, banking states and their citizens are at the whim and mercy of banks and credit institutions. Citizens are held hostage. It is no accident, and certainly no fleeting policy whim, that ‘too big to fail’ banks have been bailed out and propped up at taxpayers’ expense. The rescue patterns established during the past five years simply reflect the structural power that the financial sector wields over governments, whatever their composition. What has happened, to put things brutally, is that the elected parliamentary government component of monitory democracies has been overwhelmed, transformed into a slavish sub-sector of financial markets. These markets were protected by independent central banks and self-regulatory bodies run by the financial sector. When those self-regulated markets failed, the democratic principle of one citizen, one vote was cast aside. Electoral democracy was reduced to being the servant of high-profile banks and shadowy credit and finance institutions, powerful bodies such as private equity firms, asset management companies and money market funds that collect money from investors, such as pension funds, insurance companies and ordinary savers, then for very short periods – weeks or months at most – lend those funds to banks, governments and business firms. The extreme example of the trend, which implies the temporary suspension or outright abolition of elections and parliamentary government, has been unfolding in Cyprus. There, a collapsing banking system is being rescued through the imposition of capital controls (for the first time in history depositors within a euro-zone country have been blocked from taking their money out of financial institutions in large amounts and moving it elsewhere) and by literally robbing citizens (whose accounts contain more than 100,000 euros) of their savings overnight – two precedents that are highly dangerous, if only because as soon as the crisis intensifies in another euro-zone country, as it surely will, depositors may well move to withdraw their money in a flash, so intensifying the crisis. The deepening European crisis exposes the depth of dependence of elected governments on finance capital, and it therefore comes as no surprise that opinion polls show that large majorities of citizens in many European countries are appalled by these trends. They no longer ‘bank on’ democracy; they sense that democracy is now at the whim and mercy of banks. It’s true that there’s some public awareness of the political dangers of simplifying complexities by demonising or meting out rough treatment to individual bankers (as happened to the man formerly known as Sir Fred Goodwin, boss of the Royal Bank of Scotland, who was stripped of his knighthood and whose house was attacked by a shadowy group called ‘Bank Bosses Are Criminals’). There’s also some public recognition granted to ‘good’bankers, those who keep their dignity by telling the truth, admitting their crimes and mistakes, and offering wise advice about what next needs to happen. The assembly democracy of Athens in the 4th century BCE had Pasion, a much talked-about former slave who quickly rose through the ranks to become a citizen-owner of a money-changing table and provider of military equipment to the armed forces of Athens. Nineteenth century representative democracy featured figures such as George Grote, a banker who championed the secret ballot and democratic parliamentary reform and wrote a twelve-volume history of classical Greece. Our age of monitory democracy has George Soros, whose intelligent diagnoses of the present crisis have earned him global public respect. The plain fact nevertheless is that figures of the calibre of Pasion, Grote and Soros are today exceptional. The world of high finance has attracted risk addicts, pathological gamblers and amoral rogues. The German political scientist, Claus Offe, provocatively calls them ‘freebooters’. The term captures the mood among millions of European citizens who are victims of ‘austerity’, and who are understandably disgusted by what is going on. If justice is fairness in the distribution of life chances, then (so they reason) present trends reek of piracy, lawlessness, criminal injustice. What can be done in this European crisis to breathe life back into the least bad way of publicly handling power called democracy? Can anything be done? Learning from the past, looking backwards in order to envision a new future, is mandatory, if only because loud cries to have bankers’ guts for garters are a well-rehearsed theme in the history of democracy. Much can be learned from why past democrats felt discomfort with banks and why this disaffection triggered innovations that surely are still relevant to our times. The principle of no taxation without representation was one of the most important of these innovations. Born of deep tensions between citizen creditors and monarchs in the prosperous Low Countries, it proved to be revolutionary. In late 16th-century cities such as Amsterdam and Bruges, influential men with money to invest demanded, as citizens, that they should only agree to lend money to governments, and to pay their taxes, if in return they were granted the power to decide who governs them. The principle was first formulated in the name of democracy (democratie) in a remarkable Dutch-language pamphlet called, The Discourse (it’s analysed in detail in The Life and Death of Democracy). Its author is unknown. Published in 1583, its 24-page reasoning elaborated a new equation responsible for kick-starting a revolution in the arts of statecraft, especially in matters of public finance: since governments had to be paid for, for instance by lending them money or paying them taxes, incumbent governments are obliged to treat those who grant them money as citizens. The dynamic reasoning was peculiarly modern. In the ancient democracy of Athens, Pierre Vidal-Nacquet and other scholars have pointed out, banks were small-scale and mainly money-changers and pawn brokers. Most of the moneyed wealth in the assembly democracy of Athens never came the way of its citizens (it was usually hoarded by the rich). Banks were not credit institutions geared to speculative or productive investment, for instance investing the money of their clients in maritime loans. As the case of Pasion shows, banks were not agents of greed, champions of unlimited wealth, what Aristotle called chrematistike. Early modern banks, by contrast, were capitalist institutions. Their aim was to make money within secure political settings. This required political power to be regarded as a trust exercised for defining and protecting its citizens. Elected representatives were to be held permanently accountable to the (moneyed and tax-paying) people from whom it ultimately springs. The argument worked in favour of men of wealth, obviously, but the day came when it backfired on their heads. In the history of modern representative democracy, the principle of political trust fed a second democratic trend: political efforts to break up big banks that abused their powers and violated the trust invested by the people in their elected governments. Champions of this second principle of ‘bank busting’ recognised that banks could become too big for their boots, and that periodically, for the sake of democracy and its principle of equality, elected governments had to bring them back to earth. The first such attempt to rein back banks in the name of democracy happened during the 1830s, in the young republic of the United States. 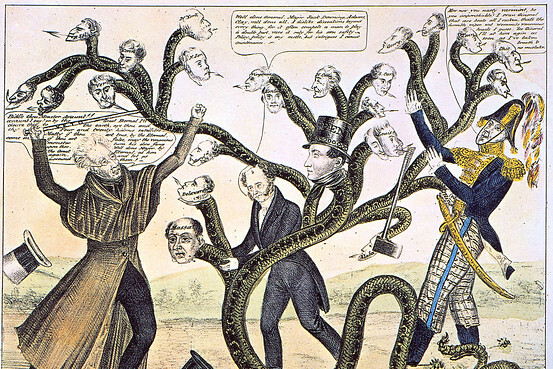 The move against money power was led by President Andrew Jackson (1767 – 1845) and his supporters. He was a strange democrat whose aggressive toughness earned him the nickname ‘Old Hickory’.Jackson was a wealthy slave holder who disliked ‘aristocracy’ and over-bearing government. In the name of ‘the people’, he took on the Bank of the United States – and managed to win, by rescinding its charter. That is exactly what Jackson did. Calling for government to ‘confine itself to equal protection, and, as Heaven does its rains, shower its favors alike on the high and the low, the rich and the poor’,he ordered the withdrawal of funds from the Bank of America. 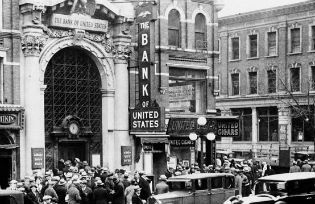 They were redirected to a variety of smaller ‘pet’ banks, which fuelled investment in land, canal construction, cotton production and manufacturing – until the demand for gold and silver coins (called ‘specie’)went through the roof, to the point where many banks fell victim to a burst bubble and collapsed. A great panic ensued (in 1837), followed by a deep stagnation from which the American economy took years to recover. The collapse was compounded by a simultaneous crisis in Britain, where banks issuing paper receipts and lending excessive quantities of money pushed up prices and destabilised the economy, until the Conservative government led by Sir Robert Peel passed the 1844 Bank Charter Act, which enabled the government to regain control over the creation of bank notes. All this is history, of course, but history is repeating itself, this time as a disastrous farce. In the European democracies, their substance and spirit under siege, millions of citizens are now convinced that banks are abusing their vast powers and whole governments are violating the hard-won principle that they’re only ever legitimate when they rest on the consent of most people. The principle and practice of government in charge of banks by consent of its citizens have been side-lined. A deep stalemate is developing. The consequences, which include deepening social injustice, political resistance to austerity (most recently, in the Italian elections) and, possibly, more Greek-style social explosions, are for the moment incalculable. So far, there’s only one country in the region – volcanic Iceland – where corrupt banks and greedy bankers have received their due punishment, using swift, decisive and radical measures. Five years ago, the citizens of one of the richest countries of the world watched aghast as their three main banks (Landbanki, Kapthing and Glitnir) went bust, and were nationalised. Government debt rocketed. The kroner fell sharply in value against the euro. Market capitalisation of the stock exchange dropped over 90%. At the end of 2008, Iceland declared bankruptcy. Public protests erupted when two successive governments tried to impose austerity measures. Demonstrators beat pots and pans in the streets and lit bonfires before the parliament. In March 2010, a national referendum was held in which 93% voted against any laws that would have made Iceland’s citizens responsible for paying more than the minimum of its bankers’debts. A 9-volume Special Investigation Commission report meanwhile slammed the criminal wrongdoings of banks, some politicians, auditing firms, government officials and administrators. Backed by citizens who were both indignant and furious, the government issued arrest warrants for the bankers responsible for the crash. A parliamentary court (the first in the history of the country) found a prime minister guilty of violating the constitution and laws of ministerial responsibility. A new draft constitution was prepared by a publicly elected Constitutional Council. Including clauses specifying the right of all citizens to have access to natural resources and the Internet, it awaits ratification through a parliamentary vote and a national referendum. Its fate now depends on the outcome of the general election, to be held this coming weekend. Will the courageous methods of Icelanders to save their democracy by politically reining in banks and bankers be adopted by others elsewhere in Europe? It’s too early to tell, unfortunately. Iceland’s circumstances are in any case special. Yet a clear implication of its recent experience is that the present crisis-ridden drift towards banking states can only be resolved by pursuing radical political reforms. Scapegoating of individuals, the demonisation of banks and caps on bonuses are not enough. Toothy political innovation that comes from ‘above’ is badly needed, yet so far in this European crisis, predictably, there’s nothing that remotely measures up to efforts during the 1930s, such as the Glass-Steagall Act in the United States, to ring fence vanilla-flavoured mainstream savings and loans businesses from much riskier ‘casino’ investment banking, for instance by creating ‘custodial accounts’ that remain the legal property of customers, whose funds cannot be used by investment banks for risky speculations and profit-driven lending. Few members of the political elites of Europe think in terms of ring-fencing democratic institutions against the reckless greed of banks. No democratic means has yet been found for shutting down failed banks without burdening taxpayers or endangering the financial system. Yes, on the way is European legislation in support of tougher rules governing how much capital banks must hold in reserve. There’s plenty of talk of the need to bring ‘ethics’ back into banking. There’s growing political interest in the so-called German Sparkassen, a network of local banks that have a civic duty to lend within a region and to promote local growth. There are pop-up makeover men, like Antony Jenkins, chief executive of Barclays, who’ve taken to wearing modest dark blue suits, ‘trust me’ shirts and plain ties. They talk in management speak, using such acronyms as TRANSFORM (‘Turnaround’; ‘Return Acceptable NumberS’ and‘’FORward Momentum’). Calls by politicians for bonus caps are growing louder. In a recent referendum in business-friendly Switzerland, voters approved the principle that shareholders must have a binding say on the overall pay packages for company executives and directors. The representatives of European Union governments and the European Parliament have meanwhile just agreed that maximum annual bonuses given to bankers, starting next year, would be equal to their salaries. Annual doubling of the salaries of powerful people heavily responsible for this deep crisis hardly seems fair. Sure, these political proposals and reforms are better than nothing, but if my short history of banks and democracy is plausible then it suggests that a much tougher and more innovative program of democratisation is needed. If the aim is to ‘throw as many wrenches as possible into the works of ‘haute finance‘ (Wolfgang Streeck), then organised pressures from below, from both voters and civil society networks, will be vital. A pertinent example is Spain’s Platform of Mortgage Victims, a militant social network geared to the protection of citizens suffering property repossessions and unaffordable mortgages. The platform is a new type of citizens’ initiative. It has managed to wrong-foot the Rajoy government by collecting nearly 1.5 million signatures in support of a petition calling on parliament to change the laws covering mortgages and to eliminate penalties for citizens who fall behind in payments. 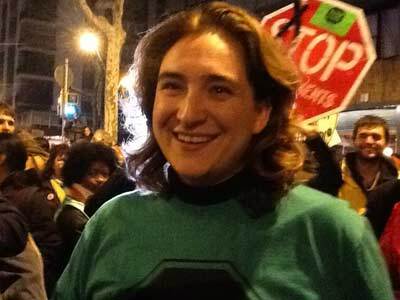 Given the scale of the developing catastrophe, surely Ada Colau, an unflinching democrat, is right about that? John Keane is Director of the newly-founded Sydney Democracy Initiative and Professor of Politics at the University of Sydney. His most recent book, The Life and Death of Democracy (2009), was short-listed for the 2010 Non-Fiction Prime Minister’s Literary Award.